The Rebel Sweetheart. 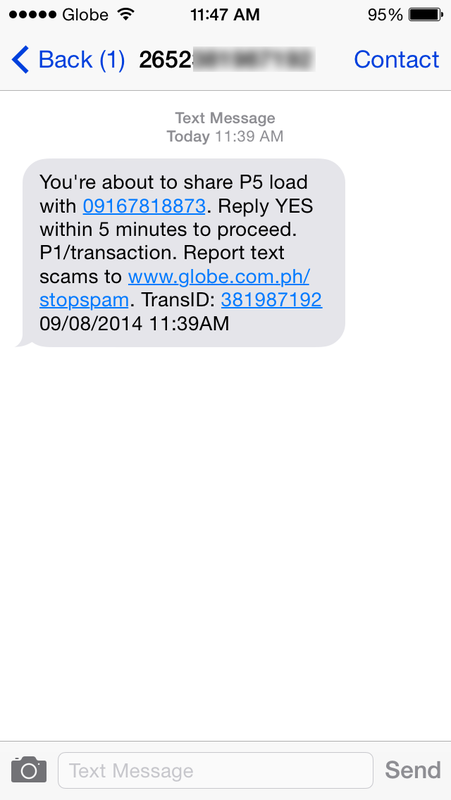 : On Countering Text Scams and Spams. A few months ago, I received this text message from an unknown number. 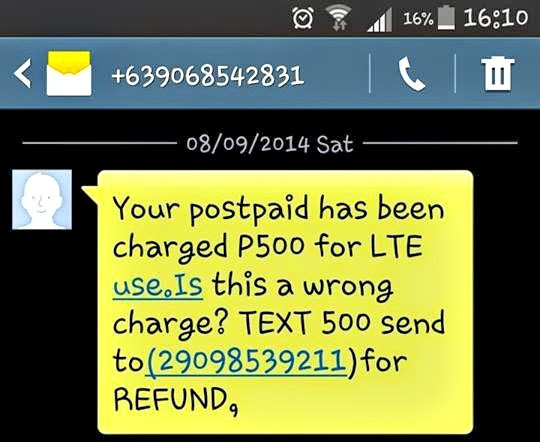 It read, "Your postpaid has been charged P500 for LTE use. Is this a wrong charge? Text 500 send to (2909*******) for Refund." I knew right then and there this was a text scam - an attempt to 'extort' money through 'share-a-load transactions'. After all, I am subscribed to Globe's Unli Data Plan and there is absolutely no chance in hell (pardon the idiom) that I'd be charged extra for my supposed LTE use. Also, I'm pretty much aware that advisories from Globe do not come from 16-digit numbers such as the one above. Instead, they are labelled 'GLOBE' and appear as such on your inbox. These text scams have become pretty rampant these days, and Globe has addressed this issue by implementing a new process where customers doing Share-A-Load transaction will be sent a validation text message. Customers doing a Share-A-Load or a Share-A-Promo transaction will be asked to confirm their transactions. The step is intended to address proliferation of text scams that trick customers into doing Share-A-Load transaction without their knowledge. The validation message reads as follows: “You are about to share PXXX load with 0916XXXXXXX. Reply YES within 5 minutes to proceed. P1/transaction. Report text scams to www.globe.com.ph/stopspam.” The validation message would come from 2652xxxxxxxxx where the last 9 digits are the transaction number. Replying to the message is free of charge. On the other hand, customers who fail to reply within 5 minutes will receive the following message: "We're sorry, but your Share-A-Load/Promo transaction has been cancelled because the response time exceeded 5 minutes. Please try again. Thanks!" Last month, Globe reduced the amount of Share-A-Load transaction to a maximum of P150 for prepaid customers and P300 for postpaid customers to counter text scams asking for P500 Share-A-Load transactions. Text scam messages are varying everyday using spiels like rewards, loyalty, MSF discount, roaming and bill overcharge, waiver of charges, refunds, etc. Globe urges its customers to immediately report thru http://www.globe.com.ph/stopspam and provide all the details required. Numbers that are reported as source of text scams will be immediately blocked from the network. Following the telecommunication company’s intensified efforts to combat text spams and text scams early this year, the number of reports using the website has reached over 42,000 since it was created in June 2014. It is a sad commentary on our world and some of the people in it that "scamming" goes on at all. I receive scam snail mail, land line phone calls and probably cell phone as well although I rarely use the thing--and of course e-mail!! You just have to be super careful. I immediately delete when I see those kinds of messages on my phone. I really don't see the point of people doing these things. Pity. Glad Globe is doing something about it! I always get so annoyed by these texts! Including those that ask if I want to buy a condo. No one is stupid enough to believe these scams now so why do they even still bother? It is awful that they can get our numbers so easily! I cannot stand spammers. They need to be caught and made to pay for all the pain they cause people! It is so sad that people have to try and steal other people's hard earned money. Thank you for sharing. I always use the rule if it sounds too good to be true it probably is and I just hit delete. I get those all the time.. they are not just annoying they are rude.. This is a great post. There are some people out there that are not aware of cell phone scamming, Thanks for sharing. I think it is sad that the scammers use every way possible to scam. I too get disturbed a lot due to such scams mentioning "your mobile number won this bumber, your email won 10-million dollars" and so on. Really wonder how they get access to our numbers or email ids. Thanks for the detailed information on how to counter scams. It's sad how scamming is becoming bigger and bigger with technology today.